City officials are ready to show off some conceptual sketches of the upcoming Cultural Arts Corridor. Landscape architects from Nelson Byrd Woltz will give a presentation on recent survey results and unveil the sketches at three upcoming sessions on Oct. 9 and 10. Community art consultants Forecast Public Art will also give a brief presentation followed by a community input session. This second round of public input follows a series of surveys in August that asked about desired features, along with types and styles of amenities people wanted to see in the corridor. Tuesday, Oct. 9 from 6:30-8:30 p.m.
Wednesday, Oct. 10 from 2-4 p.m.
Fayetteville Public Library, Willard and Pat Walker Community Room, 401 W. Mountain St.
Wednesday, Oct. 10 from 5:30-7:30 p.m. Stage Eighteen, 18 E. Center St. The architects are scheduled to return in December with a design based on feedback received during the input sessions and online surveys. Additional public sessions will be held to help guide the final design. The project is expected to transform the areas between Fayetteville’s most notable cultural hubs. 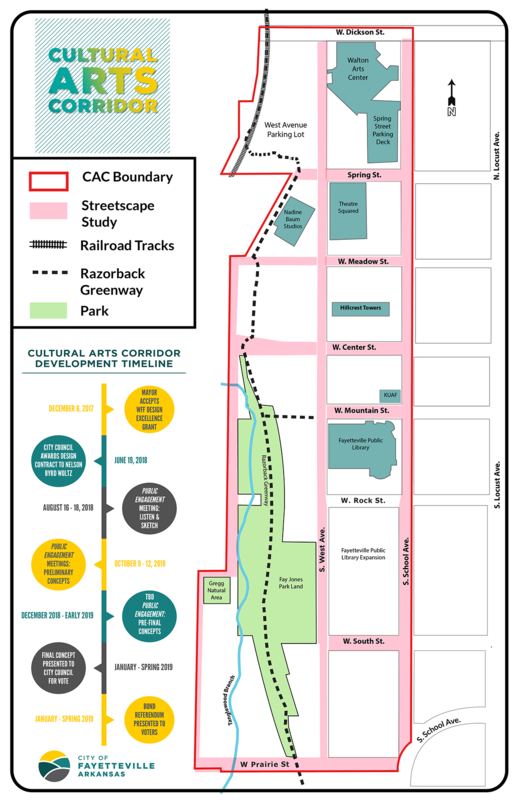 The corridor follows the Razorback Greenway from Dickson Street to Prairie Street and is envisioned as a series of public open spaces connecting the Walton Arts Center, TheatreSquared, Nadine Baum Studios and the Fayetteville Public Library. The design will incorporate playful recreation elements, public art, streetscaping, enhanced pedestrian paths, and open-air gathering spaces while integrating the natural landscape with the urban. When complete, the corridor will serve as a vibrant and memorable civic space for entertainment, community, and expression that also showcases the unique character and culture of Fayetteville. The design is funded entirely by a $1.8 million Design Excellence Award grant from the Walton Family Foundation. City officials hope to include the corridor construction as part of a capital projects special election vote next year. For more information, visit www.fayetteville-ar.gov/3456/Cultural-Arts-Corridor.